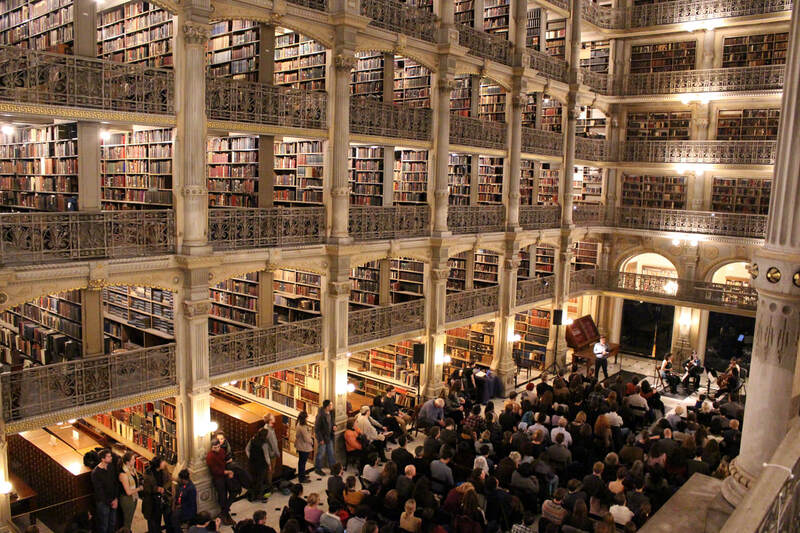 May 9, 2019 6:30pm: Stories of perseverance, endurance, and resistance: This performance in the world-renowned George Peabody Library will feature composers, authors, and artists that made substantial contributions to their field despite the oppression or adversity they faced. Including female composers, African American composers, LGBTQ composers, and a work composed in a World War II prisoner of war camp, this performance will celebrate all who have overcome oppression to make their voice heard. This performance explored the enduring legacy of the Pierrot-- a pantomime character that has been the inspiration for numerous works of literature, film, music, and art since its debut in 17th century Italy. The centerpiece of the program was Arnold Schönberg’s eerily ethereal masterpiece “Pierrot Lunaire” (Moonstruck Pierrot) performed by Balance Campaign. Offsetting Schönberg's macabre take on the character was a satirical interpretation by silent film pioneer Charlie Chaplin, shown on a large screen and accompanied by live ragtime music. 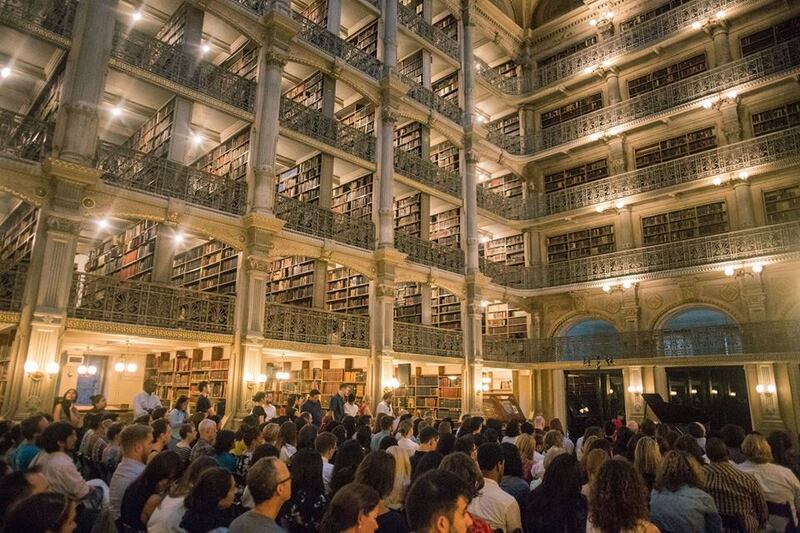 This performance took its inspiration from the George Peabody Library’s unrivaled collection of 'fore-edge paintings'-- books with secret works of art hidden in the pages. 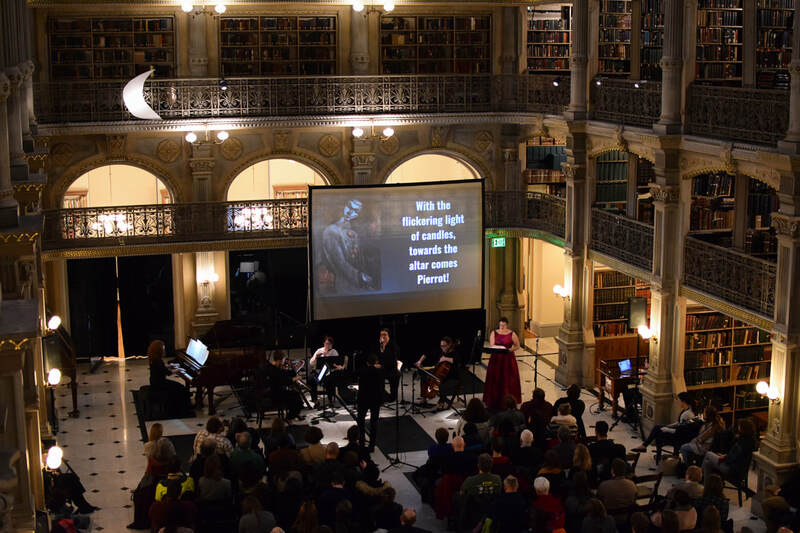 Baltimore’s own Bergamot Quartet revealed hidden musical messages and explored the meaning behind them, and the audience was given the opportunity to write down a secret of their own. This program brought the energetic Trio Jinx to the Library to explore map-making as musical inspiration. Featuring Ledah Finck, Louna Dekker-Vargas, and Yoshi Horiguchi. 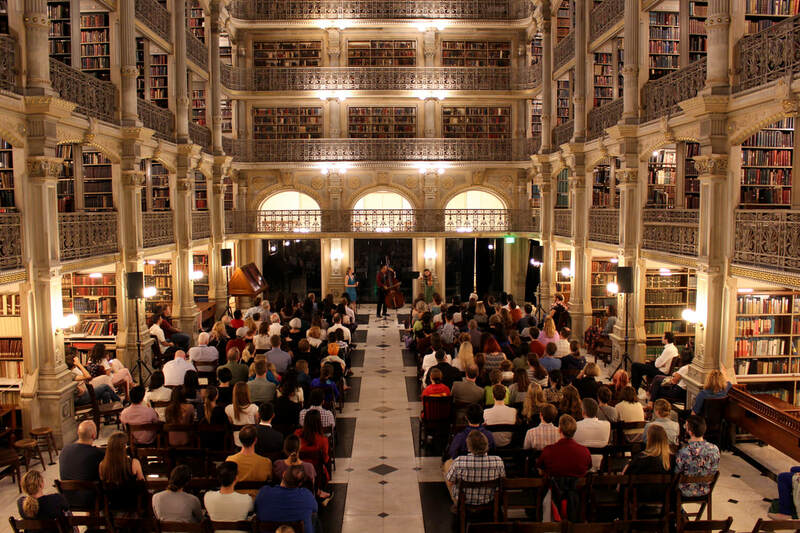 This collaborative performance dove into Baltimore's music history through the extensive archives of the George Peabody Library & Arthur Friedheim Library, revealing many rarely or never before heard works. Featured composers: Ronald Roxbury, Jean Eichelberger Ivey, Vivian Adelberg Rudow, W Spencer Huffman. Performers: Yesse Kim, piano; Teresa Ferrara, soprano; Andrea Copland, oboe; Sam Bessen, horn. 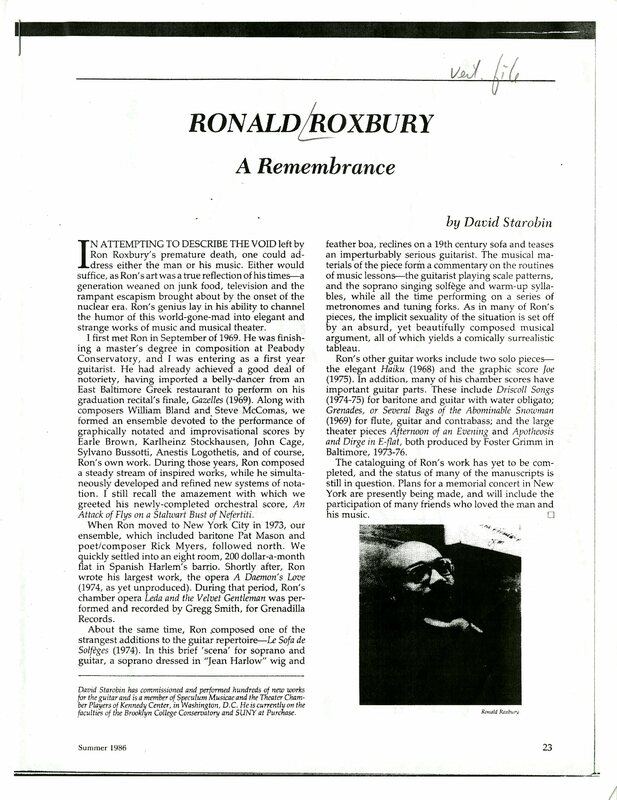 This performance explored the connection between music and text, featuring a program entirely inspired by specific works of poetry and literature. Including 15 world premieres of works for solo horn through the Fifteen Minutes of Fame commissioning project, and the premiere of Joshua Armenta's "Typewritten symbols," for horn & piano. Performers: Caleb Bradley, oboe; Sam Bessen, horn; Yesse Kim, piano. 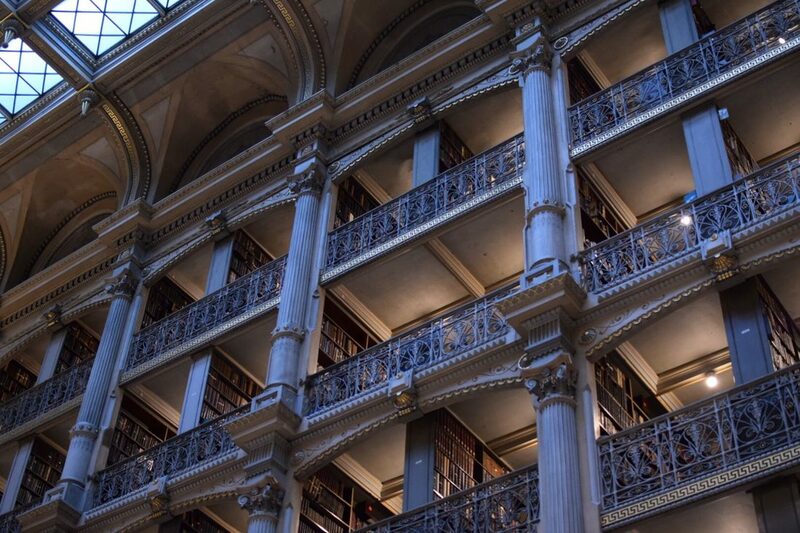 This collaborative recital took a chronological journey through the industrial revolution to explore how advancements in technology not only built the Library, but also built new and improved musical instruments. Performers: Teresa Ferrara, Soprano; Min Joo Yi, piano; Sam Bessen, horn.